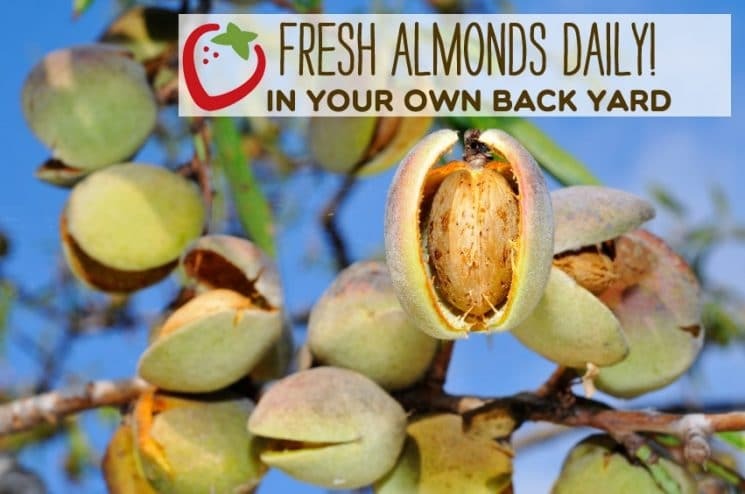 Fresh Almonds Every Day from Your Own Backyard! Not only are my kids fascinated by machines that can mass harvest a crop like almonds (yes, we watch youtube videos on that!!) But they are also intrigued that we can grow something in our own backyard beyond tomatoes and zucchini! Whether your kids are learning about gardening on a large or small scale, the lessons are priceless! Recently we watched videos on rice harvesting, a machine that harvested carrots by the millions, and then all about harvesting almonds. As a culture, kids today are growing more and more conscious and concerned about where their food comes from and how it gets from the farm to our table. What I get really excited about is how I can save money on a food that is normally quite expensive and grow it myself- LIKE ALMONDS!! Last month, my neighbor took a trip to visit her dad who is an almond grower, and she brought me back my very own plant!! I kept it indoors for the last few weeks of winter, so it started flowering (possibly a bit early!) I can’t WAIT till the harvest! Growing Almonds in your backyard!! The variety of tree I planted is a dwarfing rootstock RootPack 20. This tree is great for backyards because it doesn’t get too tall. It’s also great for commercial farming because it’s clean, the nuts never touch the ground, the truck can drive right over top and collect the nuts, and there is no dust during the harvesting. Once I got my tree (two of them actually) I asked my friend for backyard growing advice! 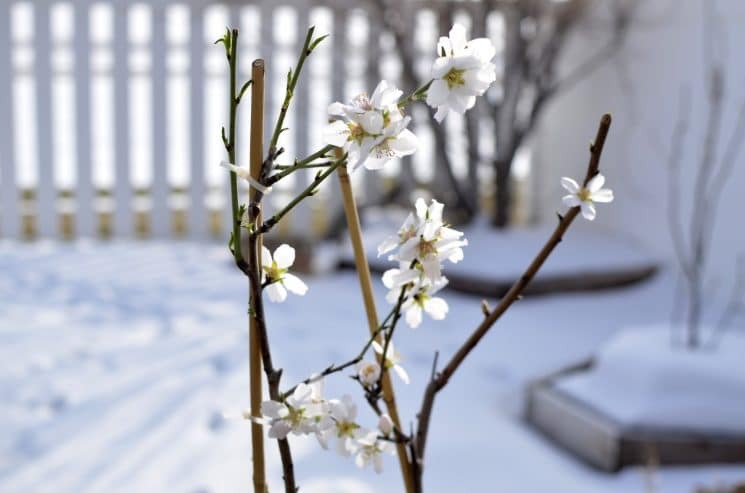 Here are some helpful hints he gave us so that we can o make your own almond tree growing a success! Plant your tree in a sunny location. This is critical in the growth of the tree and almond production. Make sure your tree has enough water, but be wary of over-watering. Use a thick Layer of mulch around the base of your tree to help keep moisture in. Almonds like fertilizer. Be sure to use a balanced fertilizer (such as a triple 12). Use approximately one cup per tree once a month in March, May, and July. Sprinkle the fertilizer about 8 inches away from the tree. Keep your trees pruned and less than 7 feet tall. Don’t forget to enjoy your home-grown almonds! 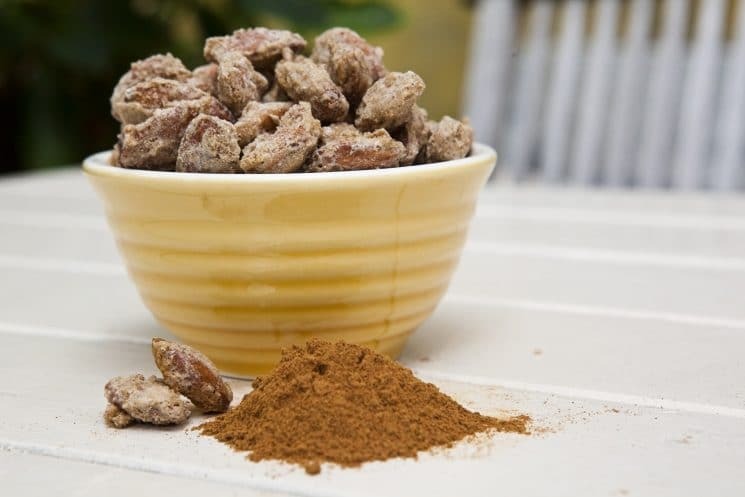 Our favorite recipe is this cinnamon almond one! 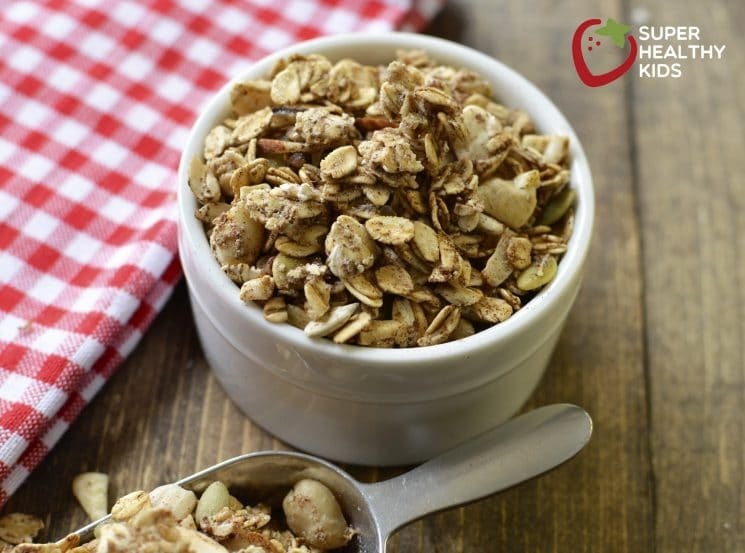 And this sugar free granola! To learn more about high density harvesting (someone has to feed the masses!!) and get your own almond tree, check out Agromillora! How long before you get mature almonds?